Having a roof leak can be one of the most frustrating experiences a homeowner can go through. Should you repair or replace it? What is the extent of the damage? How long is the repair going to last? You may be surprised to learn that many times a professional roof repair can restore and provide years of additional service. Call on the experts at City Roofing first. We are Miami’s Roof Repair Specialist and will be happy to schedule an inspection to determine the true condition of your roof. Choosing the right roofing contractor is a big decision and one that you shouldn’t take lightly. After all, a solid roof is one of the most important factors to having a safe and comfortable home…not to mention one of your largest investments. With all the horror stories you hear about unscrupulous contractors (especially here in South Florida), finding someone you can trust can be intimidating, even for the savviest homeowner. At City Roofing we treat you like family looking out for your best interest. Our goal is to provide you with the right information so you can make the best decision for your family. Most roofers want to sell you a new roof whether you need it or not! The fact is, that in many cases, a repair is all that is needed. The right roof inspection can save you not only headaches but give you the peace of mind that you can plan out and be in control of your roofs life cycle. Having been a respected South Florida roofing contractor for over a decade we are well experienced to detect water intrusion rather quickly. We take extra measures to perform water test in order to ensure that the leak is active and present. Our professional technicians take their time to go into attics to find the source of the leak. Our leak detection system is like no other. One of the best things a homeowner can do to protect their home is be proactive. As soon as you discover a leak call City Roofing at 305-248-2994, the earlier you discover and address the leak, the smaller and less expensive the repair will be. CALL CITY ROOFING TODAY AT 305-248-2994 TO GET YOUR ROOF INSPECTION TODAY! Visit our site for Emergency Roof Repairs to get more information on our repairs process. Rotted Fascia Boards: Fascia Boards are the exterior wooden trim that runs along the house. Many times a simple replacement of the wood fascia is all that’s needed however when there is evidence of rotting from the inside of the board this means that there is a leak on the roof that is causing the fascia to rot. Missing/Damaged Shingle: A Missing or damaged shingle provides an open access for water to penetrate into your roof. The placement of each shingle is extremely important as a missing or damaged one can compromise the integrity of the roof. 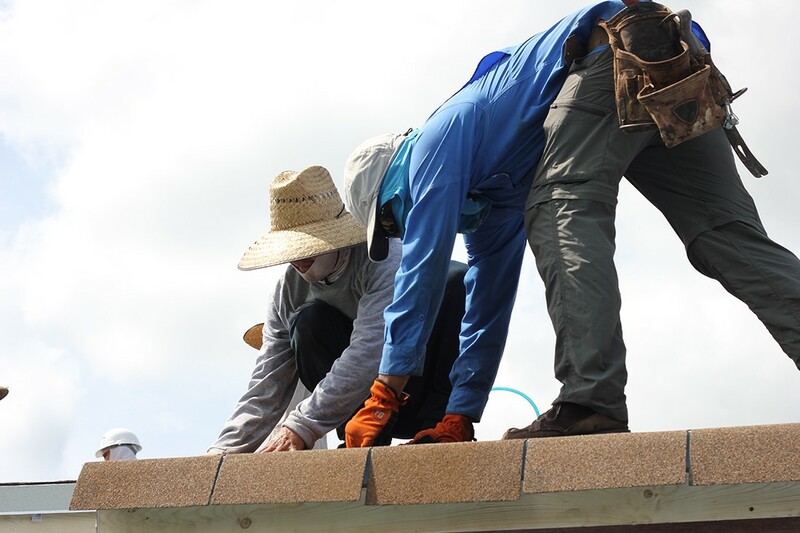 A Backed Out Nail: Nails are used during the shingle reroofing process to install the roofing layers under the shingle. Many times these nails get backed out causing a cut through the shingle causing a significant amount of water intrusion into your home. Catching this type of leak early is very cost effective and extend the life of the system. Cracked, Rotted or Loose Shingles: Unfortunately, wear and tear happens to all of us, including your shingle roof. This is one of the major causes for leaks. Our technicians will be able to determine if the roof is able to be repaired and how much time that should buy you before having to replace the roof. Shingle roofs tend to have a lifespan of 15-20 Years, many times when you’re dealing with multiple leaks it’s more cost effective to replace the roof instead. Chimney: The chimney is one of the most frequent places to find a roof leak. Your chimney has four sides that have flashing. The flashing is what protects and seals the area where the chimney meets the roof. Having a tiny crack or unsealed flashing can cause a serious roof leak as water gets behind the flashing creating all sorts of problems for you. Soil/Plumbing Vents: The soil vents is a pipe usually comprised of cast iron or PVC that extends out a hole through your roof. If the vent is not installed or sealed properly this creates an opportunity for water to get in. L Flashing/Valley Transitions: This type of leak occurs when the L flashing is improperly installed. These leaks can be very large in size due to the amount of water traveling down the valley. The severity of these leaks calls for many homeowners to put buckets to collect the water these leaks cause. If left untreated the roofs decking becomes compromised increasing the cost and scope of work on the area. Tile Leak: Here in South Florida many homes have a traditional tile roof. Tile leaks occur when the underlayment underneath the tile start to deteriorate because of harsh weather conditions, age, and of course the year round sun. If the leak is prolonged the wood decking can become rotted adding to the expense of the repair. It’s always a good idea to keep extra tiles when replacing your tile roofs as certain tile series/profiles become discontinued making it difficult and costly to get the tiles needed for a possible repair. Commercial Miami roof repairs require specialized knowledge and skills. There are several different types of roofs that can be in use in a commercial or industrial setting, and each requires a specific approach. At City Roofing we are experts in handling Miami roof repairs for commercial buildings. Built-up roofing – A very common type of commercial roofing, built-up is used on buildings with flat roofs, or low-slope roofs. Built-up incorporates bitumen, a material of a thick black substance that resembles tar. Bitumen helps to laminate several layers of roofing material together (these layers are called felts). A coat of asphalt or other surface material is placed on top. 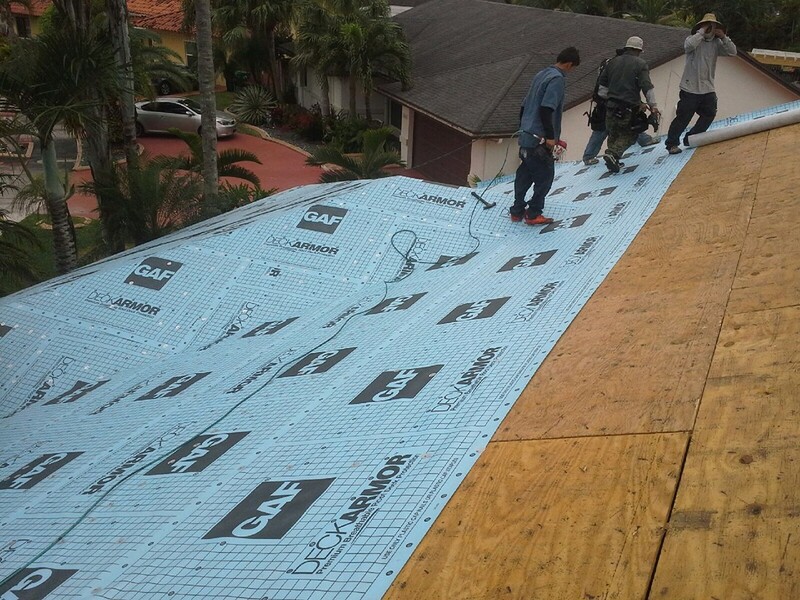 Miami roof repairs on built-up roofing requires cutting out the damaged felt area, replacing it with a section of uncompromised felt, and then adding another layer on top. Between each layer roofing cement acts as a sealant. Metal roofing – Today, about half of newly constructed commercial buildings include metal roofing materials. Metal is highly regarded, it lasts a long time, requires very little maintenance (sometime none), and it exudes a professional look. When the City Roofing’s team performs metal roof repairs, we cut out the damaged area, and clean the repair spot carefully. We take a matching metal “patch” of the same color, cut larger than the original spot, and seal it into place with a brick to weigh it down. Then, we solder each edge. After that, we use another, larger metal patch than the one we just used. Then we apply roofing cement to coat the entire area. Asphalt shingles – The biggest advantage of using asphalt shingles is their affordability. Companies like the relative low cost, the durability that shingles provide, and a wide variety of colors and styles. When you start noticing some leaking inside the building (or watermarks at the top of some of the walls), that’s a sign of potential Miami roof repairs. For commercial properties, it’s a good idea to inspect the roof annually for any problems, so that the repairs can be done before any leaking begin. If it’s just a curled or torn shingle or two, we can repair or replace the shingles relatively easily. If the roof shows signs of cracked or severely damaged shingles, or missing shingles, the roof is likely nearing the end of its useful life.